Forget the Gods — a cool concept soured by poor writing is enough to make this movie critic angry! 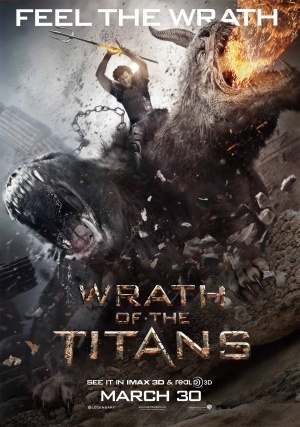 Such was the case with 2010’s “Clash of the Titans,” a remake of the 1981 film of the same name. Yet, while critically-panned (deservedly so), the fantasy based on Greek mythology still managed to gross $493 million worldwide. With their pockets lined, Warner Bros., finally acting on the rights they’d acquired in 1996, announced it was just the start of a franchise. Now, with a new team behind the camera, its sequel, Wrath of the Titans, does exactly what its title suggests: Follow the formula set by its forbearer but up the ante in almost every way. Having slain the ferocious Kraken, the demigod Perseus (Sam Worthington returns) has settled for a quieter life with his 10-year-old son, Helius (John Bell). Meanwhile, humanity’s lack of devotion towards the Gods has caused them to lose control of the imprisoned Titans and their leader, Kronos — the condemned father of the deities Poseidon (Danny Huston), Hades (Ralph Fiennes), and Zeus (Liam Neeson). Damned to the abyss of Tartarus — a dungeon deep within the underworld — the evil overlord requires the latter’s power to break free. The family drama continues when Zeus’ strength is siphoned by his second child, Ares (Edgar Ramírez). Left with no hope but oblivion, Perseus takes on this danger by enlisting the help of Andromeda (Rosamund Pike), a warrior queen, and a demigod-turned-thief named Agenor (Toby Kebbell). It’s admirable how director Jonathan Liebesman tries to improve on the film’s predecessor. The biggest fault there was the post-conversion 3D; the technology in Wrath of the Titans — which, to the dismay of many, still wasn’t shot in the format — is an obvious upgrade. Surprisingly enough, it has its standout moments, but remains underused. Also gone is inconsistent tone. Dan Mazeau and David Johnson replace the original writing team of Travis Beacham, Phil Hay, and Matt Manfredi. Though the scribes don’t stop the narrative from being as chaos-driven as the first, they spare the slow start and allow the visceral thrills to take over more quickly. Even Worthington has grown a bit; despite spewing a fair share of laughable lines he, at the very least, cracks a smile this time around. However, unlike the “Avatar” star, the rest of the cast isn’t as tolerable. Ramírez, Fiennes, and Neeson are especially obvious in their approach. As a supporting actor, Kebbell’s somewhat more likable, but the filmmakers fail to elaborate on Agenor past being the goofy, often under-appreciated, sidekick. The only real standouts are Bill Nighy, who appears during the film’s second act as Hephaestus, the god of blacksmiths and sculptors, and Pike, whose cuteness makes up for the lack of chemistry with her male co-stars. Wrath of the Titans plays it safe, allowing for passable popcorn entertainment. And while the story quickly becomes a series of fetch-quests, scenes like the one in an ever-shifting labyrinth, a rather satisfying battle with a trio of Cyclops, and the final battle give it a nice matinee feel. It does, however, leave one detail unexplained: How did Kronos, a Titan the size of three mountains, copulate? And who was the lucky lady? Wrath is only slightly more better than Clash. its in heavy rotation on hbo. the more i watch it the more i like it!